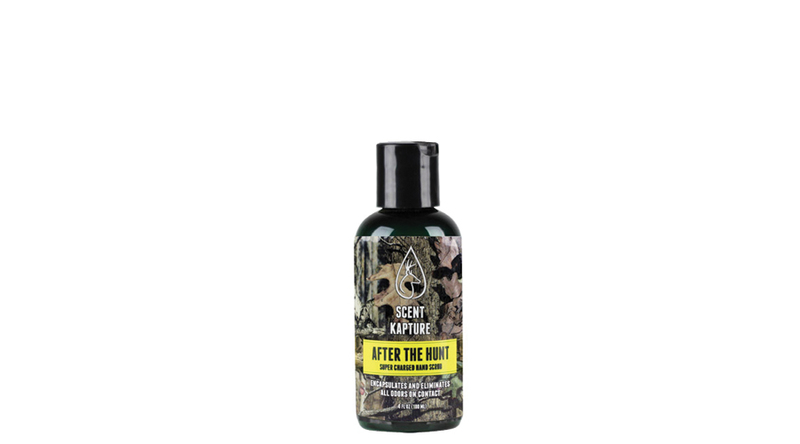 After the Hunt Super Charged Hand Scrub - Remove the Fish Smell! What is it: Super Charged Hand Scrub designed to take the fish smell and other game smells off of your hands. This emollient based cleaner removes grease, paint, tar, grime, carbon black, ink, and adhesives and odor. Enhanced with Scent Kapture Odor Encapsulating Technology that controls odors on contact by odor encapsulation and elimination. How it works: Gritty consistency creates a super charged hand scrub to remove the toughest smells and grime. It not only removes a number of tough to get out substances like grease and tar - but also neutralizes the smells associated with them. Directions: Use After the Hunt Super Charged Hand Scrub to clean your hands AFTER a long day in the field or on the water. It can be used with or without water. Works best with warm water.